...or why we are one big human family. Genealogists are familiar with the number of grandparents back a few generations, i.e. 4 grandparents, 8 great-grandparents (GGPs), 16 2nd GGP's, 32 3rd GGP's, 64 4th GGP's, 128 5th GGP's. 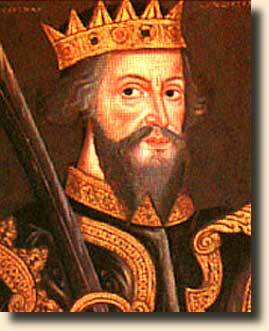 But how about the time of William "The Conqueror"
(lived 1027-1087, my children's 30th GGP)? Would you believe that we each have 4,294,967,296 30th GGP's? That is more than 4 billion of that generation only! The reason for that great number at a time when there were only 2.5 million inhabitants in England is of course that most of these ancestors come up again and again. In a family with 10 children, most of the children will be our ancestors. So their parents will come up 10 times. 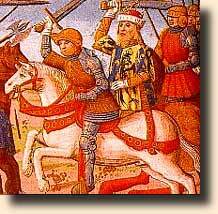 William descends in one line from Holy Roman Emperor Charlemagne and his queen Matilda has seven such lines. Since we all have Charlemagne on the "average" as our 40th GGP, you have 4.398 trillion GGP's around the time period so that each of us descends multitudinous times from Charlemagne and his queen Hildegarde. Even though there were only about 29 million inhabitants in all of Europe in 800 AD. You must be wondering by now how many GGP's (theoretical and actual) you had in A.D. 1 or 1 B.C., at the time of Christ's birth. Well, you would have 590 quintillion, 295 quadrillion, 804 trillion, 989 billion, 996 million, 531 thousand, 712 67th GGP's. However, the estimated population of the whole earth was 200 million at the time. So if you descended from each one equally, you would descend from each person 2.36 trillion times on a pedigree chart. However, unless you in your family can find any nobility or royalty with their proven historical lines you will never be able to show the actual pedigree to ancient people since our church books in Europe didn't start until c.1700. It is also true - as I have noticed among the 10.400 ancestors in my children's pedigree - that nobles and royals rarely married outside their own class. But they did have enough illegitimate offspring to make all of them our forefathers around the time of the Holy Roman or Byzantine empire and at the time of Jesus our world family thus branches out to even the furthest corners of the world, including our common ancestors in China and India. Unless, again, you are an Eskimo, American Indian or Australian Aborigine.